North Star was founded on the rock-solid belief that quality matters when approaching the work of partnering a dog with a child with special needs; how could it not, when the potential to awaken opportunities for a child on the autism spectrum exists, as well as the potential for a painful dog bite? Twenty years ago, these were my thoughts, as I began my original line from a lovely dog I purchased from Karen Webb at Star Crowned Goldens, after a great deal of research about her abilities and vision as a quality breeder for her golden lines. Star Crowned Lady Juliet was an intelligent, tolerant, and social pup who was conceived out of an interesting pairing of Meadowpond Star Crowned Tara CDX, RN, JH, WCS, VC, CGC, and Celestial Sirius Jake CDX JH WC OS SDHF VC CGC. I personally don’t pay attention to the string of impressive letters after their fancy names, but I have always paid great attention to both the soundness, as well as the temperament, of our North Star lines right from the start...and I know the achievements indicated by these letters are a direct reflection of the dogs' social intelligence, as well as soundness. The reason I went to show breeders at first (before I was able to work with CCI and other larger service dog organizations with a well-established breeding program) was because they were the ones who paid attention to the soundness of the proposed litter, no matter how expensive a proposition this became; Karen Webb was an early breeder to recognize and care about the power of canine behavioral genetics. The first North Star litter I dared to create and whelp on my own was out of an intelligent partnership between Star Crowned Lady Juliet ("Juliet") and Golden Joy’s Windflower CDX ("Cosmos"). Several pups from this very first North Star litter were paired with children, including North Star’s placement with “Star”, with two boys in Bloomfield, CT, who served his children well until his death. I kept a lovely pup named Suzy from that litter...and there is an interesting story as to how Suzy's name came to be! Here is a clip from a CT Fox news reporter Susan Christiansen (the actual inspiration of the name of "Suzy"), who documented our beginning, and highlighted how the idea of North Star was developed when we gave a friend a dog to work with the foster children she cared for. The success of this endeavor, as well as others like it, encouraged us to create North Star placements as a nonprofit concept. ...and she grew to be partnered with CCI’s (Canine Companion for Independence) wonderfully-stable Kittredge. From this litter, I kept an amazing pup named North Star Rosie. This mating and many others to come was done via cross-country artificial insemination, with both fresh and frozen surgical implantation, to increase the odds of a successful litter, to reduce the time children needed to spend on our growing waiting list. We were evolving as a quality producer of candidates for assistance-dog placements for children, and I took (and still take) this role very seriously. I was fortunate to have Dr. Ann Huntington available to us for her services in canine reproduction, as she is an expert in this field. Over the course of two decades, we've delivered many healthy North Star litters, with a variety of carefully bred service dog studs from all across the country. Due to the quality of North Star’s work, and our growing reputation for our commitment to careful nonprofit development of this field, we were able to keep children from being "priced out of the market”, or offered a substandard dog or placement because their parents didn’t have enough of the green stuff. ...and they produced several wonderful pups for placements with North Star children. A lovely Rory pup was then kept to carry on the line, and we named her Molly. Molly was the most sensitive North Star dog we have bred to date...below, you can see her sweetness in action as she balances uncomfortably to nurse her pups efficiently. The pup on the far right is North Star Lily, a talented pup we kept for breeding this line into its seventh generation. Most of Lily’s eight siblings are currently in the process of being placed with children with special needs. Lily is gorgeous, and her looks, as with the Siberian fox, just come with the package. You can read about this in National Geographic, how they bred this particular breed of fox in Siberia for temperament, and after ten generations had produced foxes as tame as puppies. What was odd was that the fox cubs looked like Disney fox cubs, with pert upturned noses and big expressive eyes. They admit they couldn't figure out quite why, but I am happy just to learn this result, as it is the same uncanny thing that happened with us...with so many of our dogs developing facial expressions, along with a wider of emotional range in their interactions. Many other qualities more important than looks are being fine tuned as the generations pass, however, with such abstract qualities as forgiveness routinely included on temperament tests. These are valuable, if overused, tools for selecting a pup for a child...but it should be partnered with a careful reading of the pup's pedigree, as well as a summary of observations made at different times in the specific pup's history. All this is why funding is needed, to prevent the growing demand in this field from leaving innocent families and children vulnerable to overcharging, which sometimes put the very child they want to help in harm's way. Even if the danger is simply the disappointment of a child, or a deep hit to the wallet, this should be unacceptable to us as a civilized society. A pup is only worth the money you pay for if it is the quality you seek. Simply being aware of what you seek for your specific child is the main thing, of course, but being aware of the funding needed for the ongoing nature of this work, as well as what liability is being taken and who is paying for it, is important to know if we want to help as many children as we can in the future. .
Our second North Star line began when we received a lovely pup for breeding named North Star Kumari. This lovely dog has a glossy red coat, and was bred and donated to North Star by Dr. Jamie Young, who is a vet and longtime quality breeder of dogs meant for service work. In 2015, Kumari was bred to Canine Companions for Independence's Oz, to produce sisters Nola and Nahly. By this time, we had created over 20 North Star partnerships with children in our fifteen years of incorporation as a nonprofit, and we had made many friends, who would come and help me to socialize the puppies, which proved a great blessing in our time of need. This summer had a sad beginning, but time can pave our way out of despair for us, one step at a time. When tragedy strikes or severe trauma persists, I consider this state to be like living in a burning building, or inside a house that has already burnt down. ignore it as long as you can as I do, knowing it is just our human nature to stay put in times of great trauma. If you have children, then, truthfully, the only choice you have is to move to another healthier spot to raise them, where things still grow...close to the earth, and cool with its breath of fresh life. Then, day by day, you and yours rebuild together, allowing the future to envelop you with time, and to create your own "new normal" with those you love. But before leaving, I always try to look around and take the most important thing I see, metaphorically speaking...the glittering piece of wisdom still unravaged by the flames of anguish and despair, something to learn that I can take with me, as solid as any talisman, to carry into my brilliant, but still-uncertain future. The loss of Nahly’s pups, along with the dovetailing loss of the normalcy of Scout and Shadow’s early days, forced us to structure some social experiments we never would have wanted to create. But, nonetheless, they revealed interesting results, anecdotal though they are...for me, they are the breadcrumbs I follow to move forward in understanding this work, and to continue to craft a powerful therapeutic tool for children, while respecting both nature, as well as nurture, in the process. As we now know, it is the interplay between the two that matters the most here. We know from science that it is not just nature or nurture that determines any pup's, or child's, ultimate temperament, but a dynamic combination of the two. We aim to keep it simple at North Star, and so we reward what we like with our pups, we discourage what we don't in a gentle and communicative way, we model or shape behavior we want and we readily ask for forgiveness, or offer it, when appropriate. As a result of these techniques, and all of the aforementioned special considerations that were needed, Scott and Shadow forged deep bonds with their families and their children…deeper than even we had been experiencing to date, with an earlier timetable for placement. The quality of one of the pups in particular, Shadow, is apparent in the pictures below; he was paired with a medically-fragile young boy, with both autism as well as Down Syndrome, named Jonathan. This team’s connection was immediate, and this partnership profound, for he has brought out Jonathan’s playful nature, as well as his increasing ability to be assertive with others through this carefully-structured and supervised relationship. You can clearly see here that training is not the most important part of this placement, although as Shadow grows into his second year, this is taking on a stronger role. It actually reduces cost, and certainly potential failures, to breed specifically for this work...and I find that when I breed for temperaments conducive to working with children, I achieve a highly-consistent amount of socially talented (and sound) pups within any given litter. The specific breeding for the twin goals of social temperament as well as sound genetic structure is tricky business, but both should be kept uppermost in mind for any potential North Star pairing; you don't want to allow Nature to trip us up any more than we are already forced to accept. Still, Nature likes her variety, and this inadvertent social experiment revealed something interesting. Despite the unusual amount of socialization we did with Scout, he ended up the rare pup who didn’t make the cut from our litters to become a North Star dog. I lived with Scout for a few months after he was released from our program, to see if I could reverse this tendency he had developed at his puppy-raising home to become growly with other dogs when resources were at issue, and I was successful in getting him to instantly nip any growliness in the bud just by calling his name in a firm tone...which pulled him from the guarding activity, and moved him to immediately come front and center to me at the ready for the next command. But, no matter how hard I tried, I could not get him to stop resource-guarding completely, especially if he was unusually hungry or stressed by a new dog joining our little pack. Scout just had to communicate his dominance to the other dogs, and even if he never got into any dog fights in his attempts to guard and rule at North Star, still, this isn’t an acceptable quality in a working North Star dog, as it can cause trouble at home, or for public access, and can easily trip up an amazing and expensive placement in a rapid heartbeat or two. Meanwhile, back at the ranch, Nahly’s sister, North Star Nola, had two litters back-to-back before retiring from breeding, both out of “Kash” (Riverdance Run Fur The Money RE OA AXJ OF CC CCA NW3). North Star Ruby was selected from this litter for carrying on this line, with her first North Star litter tentatively due in 2018. Here’s a video that Dan produced of Ruby’s sister, Moxie, that traces her journey from being raised by a classroom full of first graders in Pennsylvania, to her new life with two girls in New Hampshire, called “Moxie on the Move”. North Star Nola’s second and final breeding produced ten lovely pups from “Kash” once again, with one of them, North Star Sanza (in a timely Game of Thrones-named litter! ), to be kept to produce the next generation of this line. Just look at all ten babies of Nola’s most recent litter, with the Whitewalker existing like a giant exclamation point to mark the end of the thought that Nature likes variety...as well as a reminder to always value the differences we find! We’ve continued to evolve as a small business over the years as well, and you can trace the path taken since our incorporation as a nonprofit in the year 2000 as a company for the new millennium. We are now getting our current and future crop of North Star breeding dogs tested for their DNA, as being able to identify and trace our North Star pups as products assures us the ability to keep our pedigrees as clear of problematic genetics as we can, as well as to understand the genetic unpinning of our North Star lines to produce the best therapeutic tools we can for the children we serve. The field of canine behavioral genetics is as young as that of animal-assisted therapy for children on the autism spectrum, and so I vow to stay on top of both as we move North Star’s commitment to help children far into the future. Right from the start, we have requested just half of true cost from our families by way of donation level. This fact, combined with the recession, made our last decade of service a real challenge to survive. Overages in this field are legendary and understandable, and failure for us is expensive, emotionally as well as financially. Despite these challenges, we are now moving toward our twentieth year of breeding specifically for North Star’s work, with several golden lines we are developing to possess the level of soundness in both body, as well as temperament, for work with children. The field of Canine Behavioral Genetics is still in its infancy, but we know careful breeding can produce this soundness, as well as specific canine temperamental traits such as tolerance for children, social intelligence, and willingness to work. Our socialization program for our pups in training begins at birth, with the pups being gently handled and exposed to a variety of textures, places and interactions with people in evidence-based ways to improve our chances of success for a North Star dog in the public realm, as well as within a child's home. When we go outside our breeding program we do this carefully, ensuring the breeder in question holds our high breeding and whelping standards. At first glance, it may not seem like a puppy and an airplane part have a whole lot in common…but both can be iso-certified, as both are critical to working on a literal wing and a prayer. 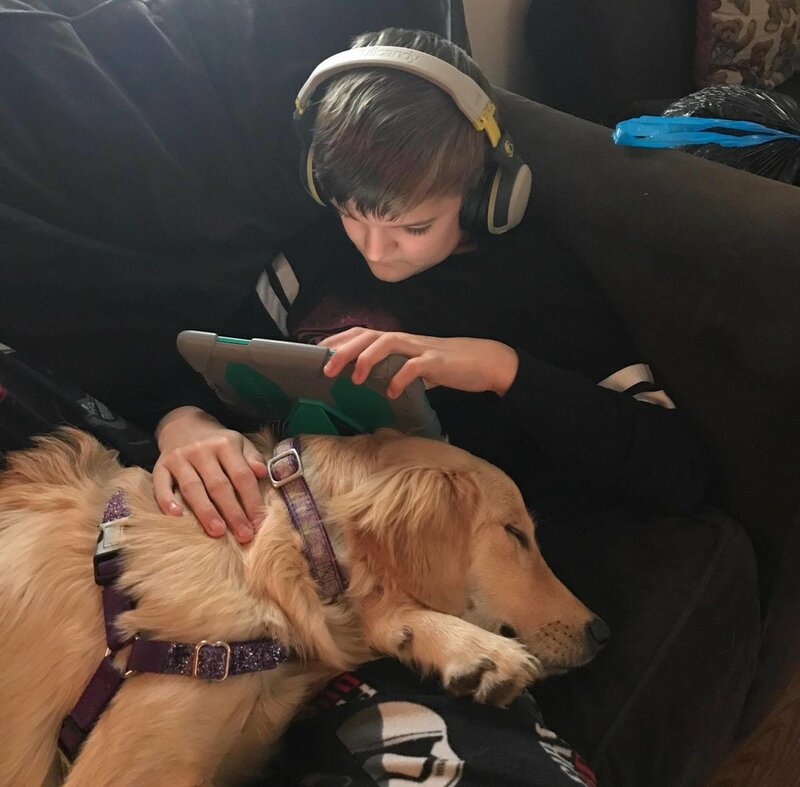 Seeing a young and stubborn pup as a “non-compliant product” requiring a “root cause analysis” may feel like a stretch…but, we are leaning into the direction that therapy and assistance dogs are taking regarding their importance as therapeutic tools for children on the autism spectrum. North Star Foundation is proud to have partnered up with Puddle Jumper Puppies for over a decade now. In this time, we have created over a dozen exceptional North Star kids/canine partnerships with Mary’s poodles, which are anything but standard. They are a certified breeder for our therapy and service dog work. It may take a village to raise any child, but for children with social and emotional challenges such as autism presents, it takes villagers willing to work together...and sometimes, it takes something as simple and as complicated as a well-bred, well-socialized, and intelligently-partnered canine companion. Donations are greatly needed to support our quality breeding and partnership program, to be able to create the safest and most effective relationships between children who face challenges and their North Star dogs, and to enrich the services we provide for them. Checks should be made out to "North Star Foundation," and sent to my attention to the address below...you may also choose to made an online donation on the “Stripe” feature here on our website. Either way, your donation is not just greatly needed and appreciated, it is also considered tax deductible, as we are proud to be a 501©3, nonprofit organization (EIN# 06-1589586). To continue to follow our work breeding, socializing and partnering North Star dogs with children who face social and emotional challenges, please write me at pattydobbsgross@gmail.com with any questions or comments, Facebook-friend me, or sign up to receive our free electronic newsletter.